Waleed Communications Co. (WACOM) Ltd. is part of the prestigious Omar Zawawi Establishment (OMZEST) Group of Companies. WACOM is an authorized partner for Unify GMBH. We are representing UNIFY for Supply, installation and maintenance of UNIFY OpenScape 4000 and Business series of IP, Digital and ISDN systems and various telecom applications. WACOM is an authorized partner for Motorola Two Way Radio products in Oman. 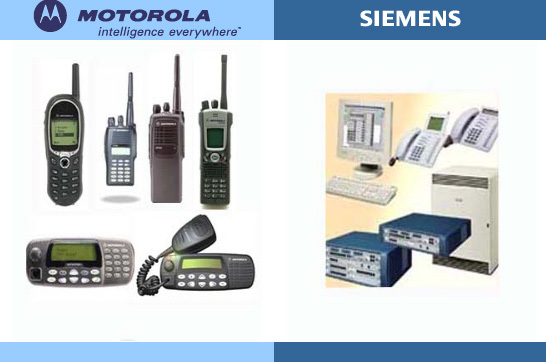 Motorola is the leader in radio and network infrastructure systems such as TETRA, MOTOTRBO, Astro, PMR etc. Established in 1979, Waleed Communications Co. (WACOM) Ltd. is in the business of distribution of radio communication, Telecommunication products and systems. Also providing total communication solutions for customer specific applications, including sourcing, supply, system integration, installation and commissioning services. WACOM is also specialized in the provision of maintenance services, contracts of telecommunication equipments and networks for large oil companies, security services, banks, etc. It has a showroom and professional service workshop facilities in the heart of the main city in Qurum. The quality of the support services is maintained by employing qualified and experienced Electronics / Telecommunication engineers. All engineers are periodically trained at the principals’ training facilities. To provide innovative and effective solutions to communications problems in remote and non-remote environments by supplying telecom systems and equipment, and supporting these with fast and reliable repairs and maintenance services. Highly skilled and qualified technicians and engineers, very experienced, well informed and helpful sales staff with dedication. VHF and UHF communications system. Digital ISDN IP Siemens PABX systems. Secure, Conventional and MPT1327 Trunked radio system. Ministry of Defence – Telecommunications system. PMR Trunked radio system projects for Oil & Gas Exploration Company in Oman. Omantel – WLL project for Rural Telephony. Siemens DECT system projects for various hospitals. Security, Services & Force: Diwan of Royal Court, The Royal Office, Royal Court Affairs, Royal Oman Police, Royal Guard of Oman and Ministry of Defence. Oil & Gas: Petroleum Development of Oman, Occidental of Oman, Oman LNG, Daleel Petroleum and Oman refineries. Manufacturing Company: Sohar Aluminum Co., Vale Oman Pelletizing Co. and Oman Methanol Co.
Health Care: Royal Hospital, Khoula Hospital, Rustaq Hospital, Nizwa Hospital, Sinaw Hospital. Hotel Sector: Grand Hyatt, Barr Al Jissah, Al Nahda Resort, Intercontinental etc..
Apart from the above, WACOM is regularly involved in the supply and installation of Motorola Radios and Siemens Small range of PABX to various companies and Government organizations in Oman. With a growing domestic customer base and expanding services network, we are poised to become a market leader in this product and solution industry. Our mission in this industry is to be the best solution provider combined with best of class and proactive customer support despite the best products sold. Our technical support is always available towards our customers for any of the products’ lifetime.